Bronson is a city in Bourbon County, Kansas, United States. As of the 2010 census, the city population was 323. Bronson was founded in the 1880s. The first store and post office opened in September 1881. The city was formerly named Wilsonville, but it was later renamed after Ira Bronson, a Fort Scott attorney. 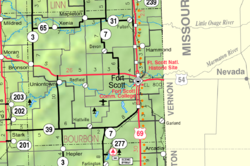 Bronson was moved to its current location when the Missouri Pacific Railroad bypassed the original town site. In 1910 Bronson held the world's first horseshoe pitch tournament. Bronson is located at 37°53′48″N 95°4′21″W﻿ / ﻿37.89667°N 95.07250°W﻿ / 37.89667; -95.07250 (37.896562, -95.072520). According to the United States Census Bureau, the city has a total area of 0.43 square miles (1.11 km2), all of it land. U.S. Route 54 intersects K-3 on Bronson's east side. As of the census of 2010, there were 323 people, 131 households, and 83 families residing in the city. The population density was 751.2 inhabitants per square mile (290.0/km2). There were 153 housing units at an average density of 355.8 per square mile (137.4/km2). The racial makeup of the city was 90.1% White, 3.4% African American, 0.9% Native American, 3.7% from other races, and 1.9% from two or more races. Hispanic or Latino of any race were 6.2% of the population. There were 131 households of which 32.8% had children under the age of 18 living with them, 47.3% were married couples living together, 13.0% had a female householder with no husband present, 3.1% had a male householder with no wife present, and 36.6% were non-families. 34.4% of all households were made up of individuals and 17.6% had someone living alone who was 65 years of age or older. The average household size was 2.47 and the average family size was 3.17. The median age in the city was 39.6 years. 28.8% of residents were under the age of 18; 5.5% were between the ages of 18 and 24; 21.5% were from 25 to 44; 27.5% were from 45 to 64; and 16.7% were 65 years of age or older. The gender makeup of the city was 46.4% male and 53.6% female. As of the census of 2000, there were 346 people, 147 households, and 93 families residing in the city. The population density was 814.3 people per square mile (318.1/km²). There were 164 housing units at an average density of 386.0 per square mile (150.8/km²). The racial makeup of the city was 94.51% White, 2.31% African American, 2.02% Native American, 0.29% Asian, 0.29% Pacific Islander, and 0.58% from two or more races. Hispanic or Latino of any race were 0.58% of the population. There were 147 households out of which 31.3% had children under the age of 18 living with them, 53.1% were married couples living together, 8.8% had a female householder with no husband present, and 36.1% were non-families. 34.7% of all households were made up of individuals and 20.4% had someone living alone who was 65 years of age or older. The average household size was 2.35 and the average family size was 3.06. In the city, the population was spread out with 27.2% under the age of 18, 6.6% from 18 to 24, 24.6% from 25 to 44, 24.6% from 45 to 64, and 17.1% who were 65 years of age or older. The median age was 39 years. For every 100 females, there were 98.9 males. For every 100 females age 18 and over, there were 85.3 males. The median income for a household in the city was $26,806, and the median income for a family was $32,656. Males had a median income of $25,588 versus $21,563 for females. The per capita income for the city was $12,332. About 11.4% of families and 13.8% of the population were below the poverty line, including 17.5% of those under age 18 and 23.9% of those age 65 or over. Bronson is served by USD 235 Uniontown. The Uniontown High School mascot is Eagles. Bronson schools were closed through school unification. The Bronson high school mascot was Bulldogs. Jonathan M. Davis, Kansas state representative, senator, and 22nd Kansas governor; born, raised and buried in Bronson. ^ "2010 City Population and Housing Occupancy Status". U.S. Census Bureau. Archived from the original on July 21, 2011. Retrieved April 10, 2012. ^ Blackmar, Frank Wilson (1912). Kansas: A Cyclopedia of State History, Embracing Events, Institutions, Industries, Counties, Cities, Towns, Prominent Persons, Etc. Standard Publishing Company. p. 235. ^ Rydjord, John (1972). Kansas Place-Names. University of Oklahoma Press, Norman. p. 497. ISBN 0-8061-0994-7. ^ "Many Towns Have Disappeared". The Fort Scott Tribune. Jul 16, 1976. pp. 2C. Retrieved 16 May 2015. ^ Kansas: A Cyclopedia of State History, Embracing Events, Institutions, Industries, Counties, Cities, Towns, Prominent Persons, Etc. ^ Becker, Sharon R. "Frank Elroy Jackson; Kellerton, Iowa". Welcome to Ringgold County. Iowa Gen Web Project. Retrieved 4 July 2014. ^ DeLorme. Kansas Atlas & Gazetteer. 4th ed. Yarmouth: DeLorme, 2009, p. 66. ISBN 0-89933-342-7. ^ "Uniontown USD 235". USD 235. Retrieved 4 January 2017. ^ "Bronson Victor 21-7 At Welda", The Iola Register, 1 November 1961, p.6.